The Ulster Orchestra is Northern Ireland’s only professional symphony orchestra. Providing symphonic music across several platforms, including Concerts, Events and Workshops. To effectively communicate Ulster Orchestra’s key information and Events with a visual and engaging presentation, ensuring ease of use is of paramount importance. Inspirational design reflective of Ulster Orchestra’s unique brand. An easily navigated site with clear information at the forefront. The Zesty design process focuses on ensuring that Users achieve what they set out to do on a website. Our scoping process is built firmly on the principles of user-centred design; this involves asking the right questions and making decisions based on the information compiled. To fully understand project requirements further to the tender process, the Zesty Team met with key individuals to conduct stakeholder interviews which focused on articulating company brand, tone of voice and business of objectives for the new website. To gain an in-depth understanding of user groups, we identify their objectives, needs and motivations through Analysis and User Research. For the Ulster Orchestra project, User surveys were distributed via email newsletter and via Ulster Orchestra’s social media channels to establish how Users scored the current site from a usability point of view. This survey was created using Google Forms and results were collated within Google Data Studio. Key insights formed recommendations which influenced the Information Architecture, Wireframing and Design phases of the project. At project outset an in-depth Analytics review provided an overview on how Users engaged with the current site and ensured tracking was in place in order to effectively measure site performance and provide benchmarking for the new site. We designed and built a responsive, accessible, mobile friendly site that encourages users to engage with prominent calls to action. The intuitive navigation was designed to appeal to Ulster Orchestra’s wide-ranging demographic. Our UX Team created a new Information Architecture and Navigation structure that has been tailored to user needs, allowing them to find the information they need in an intuitive and organised way. Specific user demographic groups are catered for, including families and young ambassadors. The design concept maximises Ulster Orchestra’s beautiful suite of visual content. The homepage includes an immersive video which encapsulates the energy of performance and encourages users to engage with the main ‘Discover What’s On’ call to action. The font chosen reflects the font from the Ulster Orchestra logo, ensuring consistency and brand compliance. The colour palette has been deliberately restricted to a limited selection, utilising grey and teal. Magenta was also used sparingly to highlight key information. This allows the visitor to be drawn in by the beautiful imagery, whilst helping them to easily access all the relevant information that they need. The teal colour is used to highlight sections and key information and provide consistency across the site. The design is clean and clear, allowing for ease of use and understanding by users of all ages and digital fluency. The overall look and feel of the site, however, is contemporary and visually striking to attract and inspire younger users. 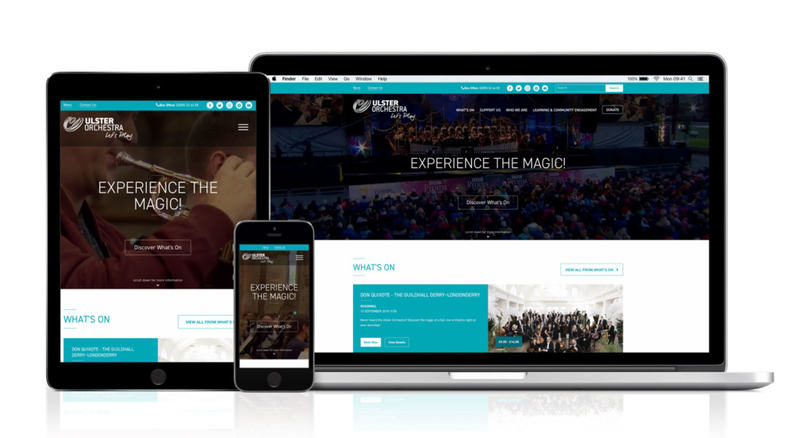 Zesty redeveloped the Ulster Orchestra site on a Kentico Content Management System (CMS). Kentico was selected because it provides the usability, extensibility and flexibility required to meet project requirements now and in the future, as further integration is planned to facilitate an in-house ticket booking process. Events calendar – fully searchable by date, keyword or an associated tag. Kentico provides full-text search functionality for websites out-of-the-box, which provides relevant results, great performance, flexibility and ease-of-use. Addition of a Learning and Community Engagement Section (LCE) – showcasing the value and contribution of Ulster Orchestra within the local community. We have given due consideration to accessibility so that everyone will have equitable access to the site regardless of any impairment. The website has been developed to conform to Level AA of the Web Content Accessibility Guidelines (WCAG) 2.0., Zesty tested the site with the following Accessibility tools; as Wave Accessibility Evaluation Tool, aChecker – Web Accessibility Checker and Cynthia Says. Prior to site go-live Zesty has a stringent test procedure. Our testing process uses a range of browser automated and physical testing across multiple versions of the platform and device. We support multiple versions of Internet Explorer, Chrome, Firefox and Safari browsers on both PC, Linux and Apple for desktop computers, as well as multiple versions of iOS and Android browsers for mobile. We have a device testing lab consisting of PCs, Mac, Android, Windows and iOS devices using different operating systems. Kentico CMS– task based user training provided by Account Management and Senior Developers ensuring the Ulster Orchestra Team are confident with the content management of their site. Go-live – A seamless transition from the existing site, with a site launch plan managed by Zesty Account Management Team. Insights – analysis and benchmarking to explain data, with a view to increase ROI on marketing and optimise the user experience. A second User feedback survey is planned for circulation to capture User feedback on the new site and to compare usability scoring to identify opportunities for refinements. Within the coming months we will be analysing site Analytics to measure site performance and provide benchmarking analysis for Client review.